Nosicelo Matandabuzo was nominated by one of her Grade 4 learners as an exemplary teacher in their community in Elliotdale in the Eastern Cape. “During break we go to borrow books she sources and displays in a corner of the staffroom,” learner Zukisiwe Mqwashele wrote in her letter. “In the morning she makes sure we eat and in class she ensures we understand the lessons. She even uses her cellphone to find information for us.” “Our school has no electricity or running water and definitely no technology,” Nosicelo told us. “Our learners walk about 20 km or more to get to school. They cross rivers.” But Putuma Junior Secondary school has been given a big boost since General Motors (GM) came forward to sponsor an iPad lab for the school. 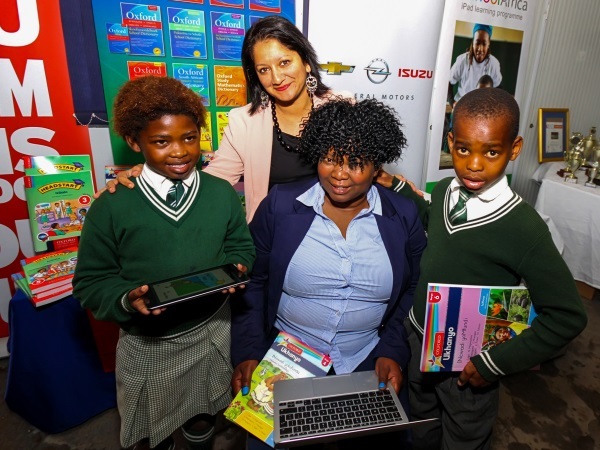 “General Motors South Africa has made a commitment to disadvantaged communities by supporting initiatives focused on education that will hopefully play a role in the development of future leaders and entrepreneurs,” says Thanusha Pillay, PR officer at GM. The iPad lab contains 20 iPad Minis, each with covers, Wi-Fi functionality and a 16 GB memory; a MacBook Pro laptop; a projector and an iTunes budget. They also receive an iPad mini for the teacher, training and membership to the iSchoolAfrica iPad community as well as R80 000 worth of textbooks from Oxford University Press. They will also become part of the Oxford Focus School project. Putuma learners are now using the iPads for reading, literacy and maths literacy. “They especially like Aesop’s Fables which they can now read on the iPads,” Nosicelo says.“Their attitude towards learning has changed. There are no absentees, everybody’s keen to learn using the iPads and there’s no noise in class – everyone is concentrating. Join a Facebook community of innovative iPad teachers with exciting classroom teaching ideas. Click here to join. We thank our sponsors: General Motors, iSchoolAfrica and Oxford University Press.